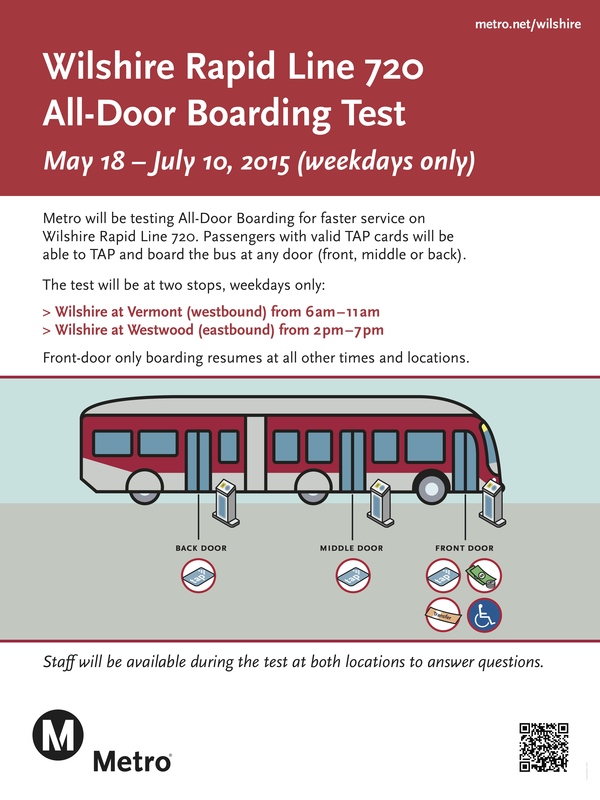 Metro will begin an eight-week test of all-door boarding on Monday on the 720 Rapid Bus that runs along Wilshire Boulevard. The test will be in two locations: westbound Wilshire/Vermont during weekday mornings and eastbound Wilshire/Westwood during weekday afternoons. The test is part of an effort by Metro to find a way to speed up buses along key routes. Buses on Wilshire already have access to more than six miles of peak hour bus lanes and the all-door boarding test is to determine if there are other ways to make some time gains. As all bus riders know, having people line up at the front door to the bus in order to pay their fares can be a time munch, especially on busy bus routes. Check out the video below (the TAP validator you see isn’t yet active). The idea here is simple. Metro wants to see if moving TAP validators to the curb and allowing passengers to pay and board at all three doors makes a significant difference in terms of the time it takes to load passengers. Metro will also observe if fare evasion is a problem if fare payment is moved away from the bus operator. The above flyer provides the details. This test also comes at a time when Metro is studying expanding bus rapid transit in the county along the Vermont Avenue and Pasadena-Burbank-Glendale corridors. Only two stops at certain times of the day for a trial period only on one bus line… this is too confusing. I agree with you 100%. I also feel that if “all door boarding” is instituted, there will be a great number of fare evaders. The ONLY way that this MIGHT work is to put Tap Valadaters at the rear doors. If Metro is unwilling to do this, then the idea of “All Door Boarding” should be abandonded. PERIOD!!! Why was the Orange Line not chosen for this test? The Orange line already has this. You are required to TAP before going to the boarding area. The Orange Line already has “all door boarding”! The Orange Line already has all door boarding. The Orange Line is TAP only and has a restricted area where you have to TAP before entering the restricted area the same way you would tap to a train platform. The problem here is because of the sidewalk you can’t restrict an area. Fare evasion happens more frequently than Metro probably realizes. I have seen this occur several times, although more for trains than buses. Honest passengers do not like this either, as they know that indirectly they are paying for it through the higher fares that this necessitates. For buses with multiple door entry, one way to reduce evasion, would be a detection system, such as the infrared detectors seen at some retail stores. Basically, this would involve two sets of detectors. One would cross the entrance doorway, and the other immediately after the tap device. If the electronic “count” of the number of passengers passing both sets of detectors did not match the electronic count of the tap device, an alarm would go off, and possibly a bright light would come on for the driver to clearly see who just passed through on his video screen. It would also send videos to the nearest security station. For trains, videos of passengers at the turnstiles, as well as at other key areas (including boarding) could also go to security. Even existing deterrents are not always operational. For example, at the North Hollywood station, there is an emergency gate opposite of the tap device location by the elevator. A sign on the gate says that an alarm will go off if opened. I have seen many people use that gate instead of tapping, and have never heard an alarm. If you would like advice as to how these situations could be implemented or corrected, please contact me at stereoscope3d@gmail.com. Metro is just unwilling to admit the amount of fare evasion that goes on! They really don’t want to spend the money that it will take to ALMOST totally eliminate this. You are NEVER going to totally eliminate the fare evasion problem, but you can cut it to a bare minimum as some people will also find a way to evade paying the fares. In addition, raising the fine, for evasion, from the present $ 250.00 to, say $ 500.00, or more, might discourage some people from evading the fares. Making Community Service at a rate of 1000 hours of service for every $ 10.00 in fine, an option, will help discourage fare evasion. The third thing that will help, is having more policing of both the busses and trains, as I ride the trains & busses reguraly, and rarely get asked for my “proof of fare”. 1) Since staff will be on site at the two locations, it’s going to be hard to evaluate the fare evasion issue, but given reports of significant fare evasion on the Orange Line, there’s little reason the same problem wouldn’t exist on the 720. 2) One of the big problems will be the clash of people exiting and entering the bus. Having a staff person on site will be a help but as these are two busy stops I predict a lot of chaos. #2 I think will be the biggest issue. Same with how it is on the blue/expo line. Y’all need to back up and let people off the bus first, okay?! Why not try it with validators ON the bus? You’ve already got mobile validators provided to agencies like LADOT. This is how SF Muni handles all-door boarding and it seems to work very well. Theoretically, you could save some time by having the validators off the bus (tap when you get there, wait for the bus, then just simply get on)… but what if a stop has to move to the other side of the intersection, or there’s a detour, or too many busses are lined up so the operator picks up 30 feet before the intersection (exactly what happened in the video above)? If the validators are on the bus, they’re always exactly where the people are going to be. Tapping as you enter the door is very simple and probably more obvious as well. Putting the valadators ON the bus makes much more sense than Metro’s present idea of having these valadators at the curb. By putting them ON THE BUS you can speed up boarding, as well as, help reduce the amount of fare evasion. There could even be a sign placed at the rear doors which reads something like this “Board with VALID Tap Card ONLY”. This could also be instituted on ALL bus routes as this would speed up boarding, making the trip a little bit faster, as well as, helping to reduce the amount of fare evasion. In addition, there should be more random fare inspections on the busses. Let’s say, for example, having fare inspectors suddenly show up at Wilshire/Western and request everyone leaving the 720 to show their VALID tap card. I also like the idea of making ALL Rapid lines “Tap ONLY, as this would speed up the boarding process and make the lines more efficient. Japan does a post-pay (pay when you arrive at your destination) system by boarding from the back and exit/pay at the front. You can’t cheat your way by not paying because you have to pay in full view of the bus driver. I see benefits of this idea working here. By boarding from the back, it ensures bus riders actually sit in the back of the bus first instead of the bus driver yelling MOVE BACK all the time and it makes the back of the bus fill up first. People who ride the bus early on the route are likely to be riding it for longer distances than those who get on the bus in the middle of the route. People who ride later along the route are likely to have shorter trips so they get to sit closer to the front exit. It ensures a faster, smoother, and more efficient way of handling passengers taking the Metro bus. It’s basically like airplane boarding process; they board people in “zones” so that those are seated in the back of the plane are boarded first and make its way to the front. I don’t see why this can’t be done with tap-in/tap-out distance based fares onboard buses either. Tap in from the rear, tap out from the exit. No way to cheat fares because exits are only done at the front, in view of the bus driver. I have seen fare evaders all the time on the Wilshire Blvd bus. When I ride that bus, it is between Western and Fairfax. The buses are so full that many people are using the rear doors. We do need this at the Silver Line @ El Monte Staton. The lines there are so long in the morning to intimidate even Metro veterans, and this feature was one of the original promises of the new station. Good idea Metro, but flawed execution. I have no doubt that all door boarding will decrease dwell times, but stand-alone validators at stops aren’t the best solution. They’re expensive, so there’s no way Metro could afford to install them at every stop. Long term, it would make a lot more since to follow SF Muni’s lead and install tap card readers at the rear doors of all Metro Rapid coaches. That way passengers can board at all doors and at every stop. That would all-door boarding to become a part of the Metro Rapid brand. Also, would it make sense to leave the middle door as an exit door and use the front and back doors as entries? Most of the inefficiency comes from the non-cash fare payment at the entry, but I’ve also observed that when the Silver Line unloads at El Monte, the crush of people trying to get out through the back door is a significant delay – up to 2 minutes – for the bus to get going again. Some announcement or signs that instruct people to use all or some doors to exit would be very helpful. “Fare Evasion” blah blah. Ever notice how many cars are on the roads without valid license plates? (1) Make the Rapid routes TAP only. If you are paying cash, take a local bus. (2) At some busy stops, discharge passengers nearside and board farside. Wheelchairs would discharge farside. (2a) At the Rapid stop, open the rear doors only for discharge to give passengers time to discharge and then open the front door and allow for all door boarding. (3) Wider doors like on some of the older airport/car rental shuttles. Guess what? People already board in the back doors on the 720 All The Time, especially at crush-load stops like Wilshire/Vermont. If there’s any wait to get on (and even when there isn’t), people slip in through the back. Metro is making a smart move by instituting all-door-boarding and giving more people an opportunity to pay easily while speeding up boarding and getting this service back to its intended “Rapid” quality. If people are really this bent out of shape about riders getting on without paying, then more on-board enforcement is necessary. But allowing all-door boarding isn’t going to make a meaningful increase in fare evasion. It’s happening, and will continue to happen, because many people are simply unmotivated by rules until there’s a severe enough penalty that it’s no longer worth the risk. I hope this system will have a positive change. I will wait and see before I comment. But I want to add when I have been to the Hollywood/Highland Station I keep seeing people who exit the disabled gate and other people rush up and enter without tapping their cards. I have reported this before and I see nothing being done that I can see to resolve this situation. Great job guys I’ve written multiple e-mails to the mayor /comments on this. They’ve had this for years in SF. SF also has wifi and cell under the bay on BART. Can LA Metro get ahead of SF in its public transit? Yes and heres how 1. you guys make touristy street cars everywhere that residents also use that go in useful loops 2.Put free wifi everywhere 3.allow food and drinks on all public transit like nyc and put coffee shops in metro stations 4. Put those bike rental stations everywhere maybe even at parks. 5. Make more 24 hour lines rail go 24 hours and faster service at night. Its that simple most of that you guys could do in the next 5. There needs to be more dedicated bus lanes and rails on streets shouldnt have to wait for lights. We need to be ahead of SF in public transit we should be number 1 heres how. 1.Add touristy street cars like SF has on useful for all loops everywhere. 2.public free wifi everywhere meaning on buses and rail. 3.allow food and drink everywhere add coffee shops. 4.More service at night time 24 hour rail and more 24 hour bus routes. 5.More dedicated bus lanes and dont make rail wait at lights on street give them right of way. 7.Make sure all the tvs work at rail stations put up clear signs about maintenance schedule outside stations. 8.Add visibile security guards at all stations they have this in SF with a booth at the ticket area for a station attendant. 9.Organize events for bike owners. 10.Create more public transit options for more events. I think there should be a suggest ideas from the public thing that everyone can vote on kinda like starbucks did for a while. Does this mean if 4 buses show up at the same time (because yes, that does happen), every driver has to wait until they are position with the TAP validators before passengers can enter/exit? Or can passengers simply TAP in same scenario and then run to the buses behind? I prefer the first option but that’ll probably still mean bus bunching again further in the route. Some people here seem to think it does! It would be wonderful to have all the things that have been proposed here, but we have to be realistic and realize that we can’t have everything, because we don’t have the money to pay for it. Some of the proposals here can be done with minamal amounts of money, while others, like streetcars, require millions of dollars. Metro could, probably put “Tap Valadaters” at the rear doors of most, if not all, of it’s busses with its current budget. This is the ONLY way that “all door boarding” is going to work properly! Otherwise Metro is just asking for more problems. China seems to have unlimited funds for transit. It’s all about priorities. You really think you can compare China (Communist country) with the US (a democracy)? 6. Workers complain, they can just fire them and hire others that don’t. Over a billion in population, they have all the labor they need to keep them under slave labor conditions. For the Commie “advantages” they have, they can have “unlimited funds” because they can make stuff 1/10th cheaper than we do here with our “disadvantages” related to democracy.